The Power-Pro SL series of racks offer a feature set which customers have embraced in today’s collision repair rack market place. 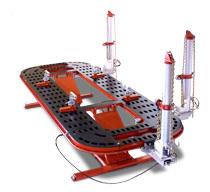 It has an extended-height lifting capability for ergonomic working heights, an open front and rear for greater accessibility to the vehicle for repairs, a faster pinch-weld anchoring system with fewer bolts to secure it to the rack platform and 60% more chain tie-downs for efficient and timely vehicle tie backs. 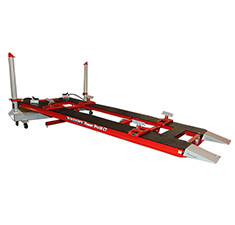 The Power-Pro SLT series of racks offer a feature set which customers have embraced in today’s collision repair rack market place. 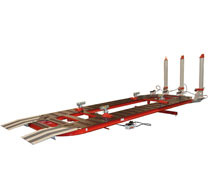 It has an air hydraulic tilt capability, a faster pinch-weld anchoring system with fewer bolts to secure it to the rack platform and 60% more chain tie-downs for efficient and timely vehicle tie backs. Learn more about the Power-Pro SLT Series. Blackhawk builds the world’s most productive collision repair equipment. Building world-class relationships with our customers and industry partners results in unparalleled solutions for today’s collision repair facilities. Regardless of your size we understand your needs and our equipment is designed to meet those needs. Blackhawk has a history of innovation in equipment design. Equipment specifically designed to enhance productivity and assure that your repairs are done right the first time every time thus assuring the shop’s maximum profitability. Learn more about the Power-Pro BT Series. Learn more about the Power-Pro CT Series. 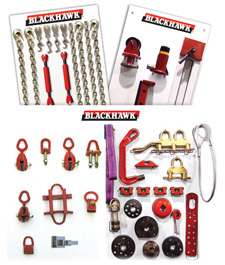 Increase the functionality and capabilities of your frame straightening equipment with these accessories from Blackhawk! 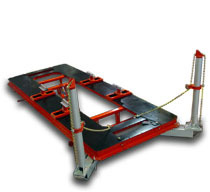 Learn more about Frame Straightening Equipment Accessories.